The most dominant female champion in MMA history is about to defend her title deep in enemy territory tomorrow night on UFC 190. Ronda Rousey will take on undefeated challenger and local girl Bethe Correia at the main event to be held in Rio de Janeiro. Brazilian Correia has not missed a single opportunity to play the bad guy in this match-up and she claims that she will be one to end Rowdy's phenomenal winning streak. However, Rousey insists that she will be victorious once again and said that this fight is the "most personal" of her career. The reason Rousey feels that way is because of a couple of comments Correia made suggesting that after she defeats the American that she hoped she wouldn't go back to doing drugs or even kill herself. Rousey's father completed suicide so she is convinced that Correia is using dirty tactics to try and make her over emotional when it comes time to square off. Rousey defiantly suggests that once she wins the fight she will leave it "someplace in Brazil as a gift" to really rile Correia. A win will take her MMA record to 12 wins with 0 defeats and increase her ever growing influence on women around the globe. 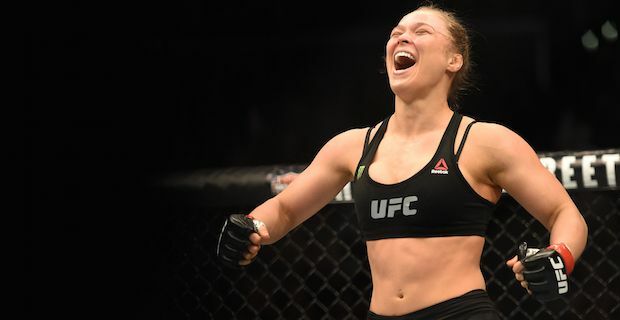 In fact, Rousey has so much crossover appeal that she is beginning to make quite an impact in Hollywood and has recently appeared in the Expendables 3, Fast and the Furious 7 and Entourage. Fellow UFC star Conor Mcgregor recently admitted that he would not like to face Rousey in a fight saying "If this lady was to get a hold of me she would throw me on my head in literally one second flat"